Mr. John Sherman was appointed by President Donald J. Trump to serve as the Chief Information Officer (CIO) of the Intelligence Community (IC) and was sworn into this role by the Principal Deputy Director of National Intelligence on 11 September 2017. 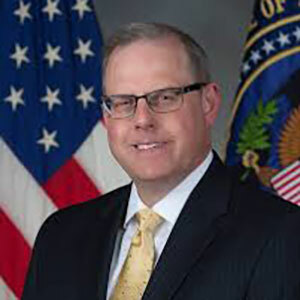 In this capacity, he is responsible for leading the ongoing modernization efforts with the IC Information Technology Enterprise (IC ITE), and other areas of the overall IC Information Environment, as well as ensuring the security and protection of the IC’s IT systems. Prior to his appointment, Mr. Sherman served as the Deputy Director of CIA’s Open Source Enterprise (OSE), where he helped to lead the transformation of Open Source Intelligence, leveraging new technologies and interagency partnerships to enhance the growing OSE mission. He previously served in several senior executive positions at NGA, dealing with analysis, collection, homeland security, organizational strategy, and international affairs. Earlier, he served as the Principal Deputy National Intelligence for Military Issues on the National Intelligence Council, and as a White House Situation Room duty officer. Mr. Sherman began his IC career in 1997 as a CIA imagery analyst assigned to the former National Imagery and Mapping Agency, now known as NGA. He has been awarded the Meritorious Presidential Rank, the Intelligence Medal of Merit, NGA’s Meritorious Civilian Service Medal, and Canada’s Chief of Defense Intelligence Medallion. He is married with two grown children, and enjoys spending time with his family and reading about military history when he is not focusing on his day job of leading IT modernization activities.